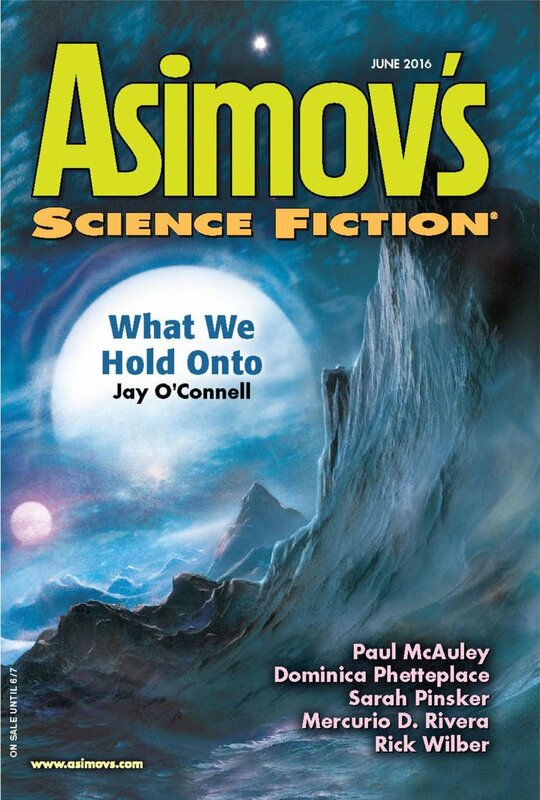 "What We Hold Onto," by Jay O'Connell [bio] (edited by Sheila Williams), appeared in Asimov's Science Fiction issue 06|16, published on April 29, 2016 by Penny Publications. Pro: Sophia struggles with choosing what to hold onto at every level of her life. Not just the physical things of her mother's but also the relationships she has with her ex-husband, her sons, and with Concord, as well as the sort of work she does. At the end, she disposes of everything except her relationship with Con, and she's finally content. Sophia's life gets more and more complicated up until the point where Cleo the cat dies, in the only deeply emotional moment in the story. Sophia doesn't get rid of Cleo--Cleo is taken from her, but as though it's given her perspective, from that point on it's all about Sophia getting rid of things and being better for it. The motif of things you don't really want to keep turns up over and over, and one pleasure of rereading the story is finding all of them. For example, when she and her boys have dinner in a reconstruction of the condo they used to live in, Sky describes it as "99% perfect and 1% awful." They reroute the dinner to a homeless shelter and go out to eat instead. Con: There's no action to the story; this is very much a literary work. Gotta admit that I was a little nervous seeing a menopausal female main character in first-person point of view being written by a male author. But no worries, all of the characterization was very good. I also enjoyed the near-future setting which was completely believable and seamlessly woven into the story. This was a 4-star for me. Well-written and very poignant. Deals with grief and loss very well. Also does a good cat. What bug me was that with all the amazing medical technology they now have in this story, middle age women still have hot flashes. Was this the only way the author could make a point about Sophia's age ? It also dragged a bit in the middle. When they were doing the 1966 modelling of her mother's childhood home. I also thought Nomad no-clothes thing was un-necessary, and so was the rudeness of the Nomad nurse near the end.